Commercial — Osborn Pacific Group Inc.
Osborn Pacific Group has collaborated with numerous architects and engineers on commercial property design. Our professional team implements sustainable designs that enhance a facility’s architecture and establishes prominence among competition. The new 777x facility spans the equivalent of 25 football fields or 27 acres under roof. Expecting up to 1,500 employees to approach this building daily prompted Boeing to explore constructing a linear park adjacent to the building and a courtyard/ plaza near the primary entrance. Osborn Pacific Group prepared several concepts; the preferred design includes special colored paving in the courtyard, canopied walkways for the employees, outdoor seating and dining areas, and landscaping that provides year-round interest. Union Stables was constructed in 1909 as an urban horse stable near Pike Place Market in downtown Seattle. In the 1920s automobiles replaced the horse-drawn carriages and the building uses transitioned to parking garage, auto body shop, and a furniture warehouse. In the 1990s the building was vacant and in serious disrepair. The building has been completely renovated and transformed into contemporary office use. Union Stable is a Seattle Landmark and is listed on the National Register of Historic Places. Special care was taken to preserve the historic character of the building. Osborn Pacific Group designed street level planters and sited the street trees to accentuate the vertical building elements. 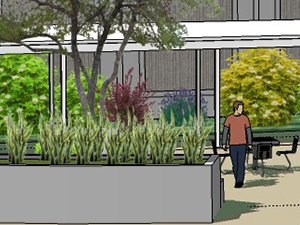 The landscape treatment also included a green roof and patio. HAPO Credit Union, a credit-union chain based in the Pacific Northwest, constructed a new branch to serve its members in Richland, Washington. Osborn Pacific Group designed the low-maintenance landscape that provides year-round interest, treats stormwater in vegetated bioswales, and provides for snow storage.